CaféLife issue 1. — Elisco's Creative Café | Advertising. Branding. Digital. Last week we said farewell & arrivederci to our four summer interns. If you’ve been keeping up with our café blog, & we hope you have, you’ve seen some of their work first hand. Theresa (Copywriting), Brandon (Graphic Design), Joe (Business Development), & Sydney (Account Management) brought us fresh perspectives & impressive work all summer long. Today, we’re thrilled to share a taste of what they created for the Elisco’s Creative Café brand. 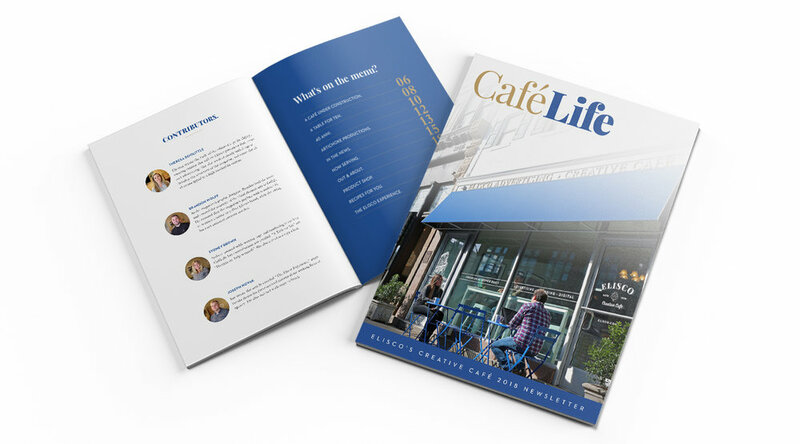 The CaféLife story started in early Spring; the initial intention being to send a simple newsletter to clients & friends of the agency. It dawned on us that we hadn’t sent out an email like this in ages. By the time our interns arrived in June, the project pot had been simmering on the backburner for months with an ever-growing list of ingredients to add in. Since our new interns had the bandwidth, we were eager to brief them. Theresa quickly pointed out that this was shaping up to be one lengthy email. This realization led the team to move to a new medium: Elisco’s own digital magazine.